Here is the list of best free Scrabble Games for Windows. These word games let you play Scrabble board game on your computer. You can either play Scrabble against computer or with your friends. Some of these free Scrabble board games can be played by two players on the same computer. In this list, you will also find some Scrabble games that do not require internet connection in single player mode. All these games are ideal for all age groups. Playing these games let you discover new words, hence improve your vocabulary. One of these free Scrabble games comes with a very interesting feature: Game Chat, where you can chat with other players while playing. Words With Friends is my favorite Scrabble Word Game. Though in this game you cannot play Scrabble against computer, it is my favorite Scrabble word game, as it lets you play Scrabble with any player across the globe on the internet. Besides this, you can also play Scrabble with your friends by connecting to them via Facebook or by searching their username. Moreover, it comes with an interesting feature of Game Chat. This feature lets you chat with other players online. Besides Words With Friends, I also like AlphaJax. This Scrabble game comes with four types of gameplays. It also lets you invite a player to play Scrabble with you on internet. Moreover, if any of your friends have Xbox account, you can play this game with them. The best part of this game is that you will get ranked according to your score. Go ahead and give a try to these free Scrabble games for PC. You will also know how to play Scrabble with these games. You may also like some best free Board Games, Maze Games, and Maze Maker Software. Words With Friends is a very interesting and addictive free Scrabble game for Windows, which lets you play Scrabble with your friends online. This is a Windows 10 Scrabble app and comes with two playing modes: Smart Match and Pass & Play. 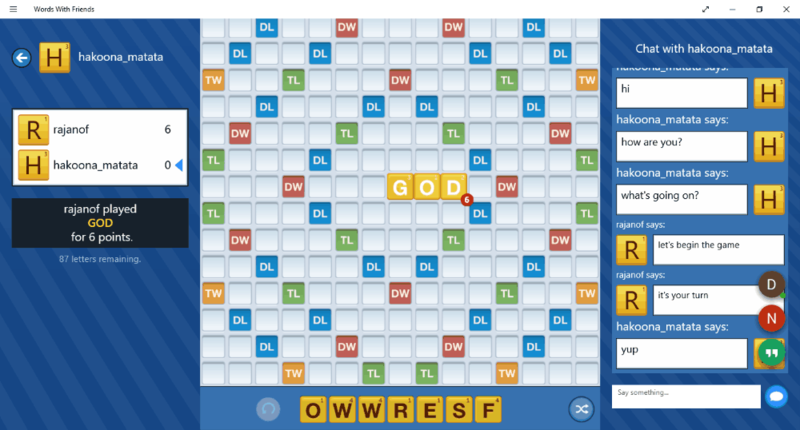 If you begin the game in Smart Match gaming mode, you will be randomly connected with other players to play Scrabble with them. The home screen of the app shows the list of all completed and pending games that you have played. You can also play completed games with your opponents again. Pass & Play: This mode of the game lets you play Scrabble with your friends on the same computer. Here you will play and pass the turn to other player and so on. You can play this game with your Facebook friends. Search your friends by typing their username in order to play Scrabble with them. Add your friends to contact list of the game (did not work properly while testing). Game Chat: It is the most interesting feature of this free Scrabble board game. Like Clash of Clans, you can chat here with your opponents while playing this game. AlphaJax is an award-winning Scrabble game for Windows. This Windows 10 app is suitable for all ages. Your aim is to score high in the game by making words of maximum possible length. For this, you will be provided some jumbled letters. Select the appropriate letters and try to make words of maximum length. Your score directly depends on the length of a word that you form. Longer the word, greater will be your score. It comes with 5 types of playing modes: Skill match, Random match, Pass and Play, Invite Player, and Friends. Pass and Play is a very interesting mode. It lets you play Scrabble with your friends or you can also play scrabble against yourself in this playing mode. Skill match and Random match gaming modes let you play this game on internet with online opponents. In Invite Player mode of this Scrabble game, you can invite any player to play Scrabble online with you. Play with Friends gaming mode lets you play Scrabble with your friends with Xbox account. You can pass your turn to your opponent, but remember, two consecutive passes will end the game. Besides this, you can swipe and shuffle jumbled letters unlimited times. Your Achievements and Statistics are displayed in Records section. Score high to rank high in Leaderboards section. It compares your score among players from across the globe and generates your rank accordingly. Global: This section displays the rank of top 50 players. Top Friends: This section displays the rank of you and your friends. Top Moves: Players will also get a rank on the basis of their best moves. In this section, you can see the total number of matches played by you, your turns, and opponents’ turns. You can view a brief summary of the games played. NOTE: You must have an active internet connection in order to play this game. Scrabble3D is a free Scrabble word game for Windows. It is an interesting Scrabble word game and a great time killer. It is a multiplayer Scrabble game that can be played with 4 players. Out of the 4 players, one must be a human. You can play Scrabble against computer or with other players on the same computer or across the globe. The rules of this multiplayer Scrabble game are simple. You will be given some jumbled letters from which you have to form a meaningful word. Meaningful words of any length are acceptable. Marks will be awarded according to the length of a word that you form. But remember that first letter of the game should be placed at the center of this Scrabble board. What I like most about this game is that you can play it online with other players across the globe. Take screenshot of game and save it on your PC. Screenshot can only be saved in PNG format. Save your current game on your computer to play later. It comes with a demo mode to show how to play Scrabble . You can run it anytime. You can view statistics of all the players in statistics section. BestWordClub is another free Scrabble game for Windows. The rules to play this game are simple. You have to pick appropriate letters from the list of jumbled letters, so that a meaningful word could be formed. You will get points for every meaningful word of any length and your points along with the time taken to form that word is displayed in scoreboard section. For each move, you will get 2 minutes, after which, your move will be passed to your opponent. It is an online Scrabble game. You can either play this game as a guest or by creating a free account on its official website. Creating a free account is beneficial, as this shows you rank on its official website along with other players. This game has an inbuilt dictionary that doesn’t let you place wrong/meaningless words on the Scrabble board. If you get stuck anywhere in the game, you can take help from its online dictionary. Its online dictionary contains 2 to 5 letter words and each of these are categorized into different categories, such as: words containing a particular letter, words starting and ending with a particular letter, etc. This free computer scrabble game is available in three different languages: English, Spanish, and French. Download Spell It, a free online Scrabble board game for Windows. Don’t worry, if you don’t have an internet connection, as you can play this game offline too against computer in single player mode or with another player in pass and play mode. In single player mode, you can select the level of computer opponent as easy, normal, and hard. The best part of the game is that you can play in more than one gaming modes at a time and each gaming mode is displayed on the screen in a list, which lets you switch to any of these gaming modes anytime. To play this game, you have to place letters on the Scrabble board from given jumbled letters. Points will be awarded only if you form a meaningful word. Each game starts with a limited number of jumbled letters which are displayed on the right side of the Scrabble board. The game ends when all letters are placed on the board. While playing a game, you can shuffle the jumbled letters for an unlimited number of times. Also, hints are provided in the game, but they are paid. You can also pass your move to the next player, but remember, two consecutive passes will end the game. WordSmith! is a very simple Scrabble word game for Windows. In this game, you can only play Scrabble against computer. Unlike other Scrabble games in this list, you cannot play it with other players or even with your friends. The rules of this game are same as other Scrabble word games. Play this game in three steps: Pick the appropriate letters from jumbled letters > place them on the board > make a meaningful word of any length and earn points as award. Training: This is tutorial mode. You can practice your Scrabble skills in this mode by playing it against computer. You can use unlimited number of hints in this gaming mode, but remember, no achievements will be awarded in training mode. Challenge: Play Scrabble against computer and try to beat it by scoring more than it. No hints are provided in this gaming mode. You can view high scores, number of games won, and number of games played in Achievements section. Quackle is another free Scrabble board game for Windows. The rules to play this free Scrabble word game are very simple. Unlike other games, it doesn’t use drag n drop method. Use your keyboard to type a letter on the Scrabble board. You will receive points for every correct word. The best part of the game is that it is a multiplayer game. Create new Scrabble boards of dimensions m x n; (7 ≤ m ≤ 40 and 7 ≤ n ≤ 40). Add multiple boards to the game and delete any board anytime. Play Scrabble with multiple players. View possible choices to form a word if stuck anywhere in the game. Add letters of your own choice in the jumbled letters rack. Pass your turn to opponent. Move to the start position of the game anytime. Move to a particular move and continue from there. Save your game on the computer in GCG format. Do note that the changes that you make in this game will take effect on restarting the game. Play Scrabble in any of these four languages: English, Greek, French, or Korean.